I’m back! It’s been exactly a year since I took a hiatus from Flogging, and a lot has changed since last May. My daughter, Kayla, was born in December and life as a new mom has been all consuming. It seems that parenthood is 80% worrying about their eating, sleeping and pooping - not exactly Flog-worthy material. But I miss writing and she is going to start solids soon, so all the more reason to return to the Flog! But, be forewarned, the content of the Flog may look a little different; We are eating out less and baby friendly recipes may appear more often. But, loyal reader, I have missed you and I hope you will come along for a new ride. I have made a brunch of new mom friends and we are frequently getting together for playdates. Some of the babies have different allergies and that means finding recipes for alternative diets for snacks. Here’s one of my new favorite cookie recipes, that happens to be dairy-free and gluten-free. Plus, it’s super easy to make, if you have a food processor. The recipe is from Rachael Ray Everyday Magazine. I did not bother to beat the egg white beforehand – I put it in the food processor instead and let it rip for a minute. I also like the ginger notes, so I doubled the amount of ground ginger. Line baking sheet with nonstick foil. In food processor, process 1 cup pecan halves, 6 tbsp. sugar and next. 3 ingredients until consistency of coarse sand, about 15 seconds. Transfer to bowl; gently fold in egg white. Drop by scant tablespoons onto baking sheet. Sprinkle with remaining 1 tbsp. sugar. 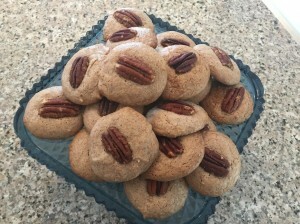 Press one pecan half into each cookie. Bake at 350° until golden on bottom, about 15 minutes. Great to see you posting again, G! Look forward to more.